It’s the time of year once again where we need to start thinking of what on earth we’re going to get Great Aunt Mildred for Christmas. Despite being the kings of a great deal, even us here at Voucherbox get stuck for ideas around Christmas time. That’s why we’ve created the ultimate Christmas hamper guide to solve all of your gift-buying problems. You can buy these for any amount of people meaning you can get a great gift for an entire family for less. Take a look at what we’ve found for you – happy shopping! Tesco’s Winter Picnic hamper is a fab Christmas gift for two. Coming in at £44.99 the hamper includes Yorkshire popcorn, panettone, raspberry ripples and a gorgeous bottle of Kintu Merlot. If you’re looking for a classic and affordable Christmas hamper, look no further than M&S’s Classic Christmas Hamper with Fizz. Complete with Bucks Fizz, Christmas pudding, ground coffee and classic teas, this hamper is an affordable Christmas addition. Fortnum and Mason’s Classic Christmas Hamper is the ideal accompaniment to your Christmas day. Full of classic treats such as milk chocolate coins, Champagne truffles, Christmas spiced tea and wines and spirits for the adults. Daylesford is an Organic Farm in Gloucestershire that is dedicated to producing natural, organic food. Their Goodwill Hamper is a gorgeous accompaniment to Christmas day, packed with fresh juices, chutneys, jams as well as cakes, shortbreads and cheeses. All of this straight from the farm to your fork. 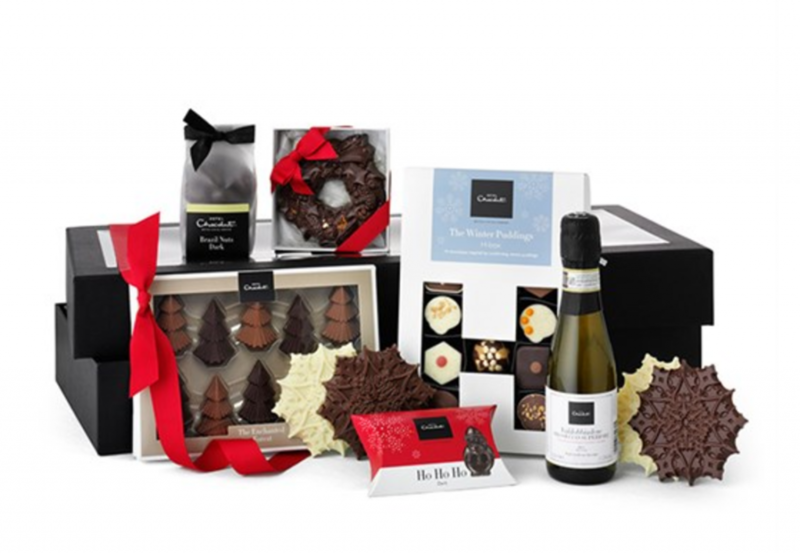 Hotel Chocolat’s gorgeous ‘Merry Christmas Everyone Hamper’ is festive favourite for the whole family. Full of gorgeous chocs such as White Snowflakes, a cookie wreath, Christmas tree chocs and a small bottle of Prosecco Superiore to celebrate. 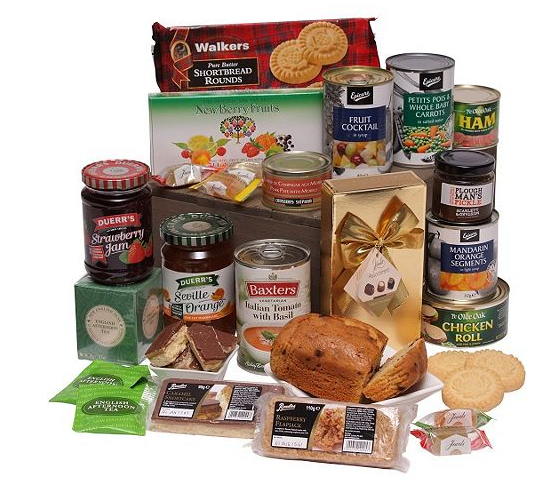 The Senior Citizens Christmas hamper from Tesco is aimed at our elderly family members who might sometimes get overlooked in the present-buying hierarchy. Packed full of English teas, Thistle Rounds, Chutney, marmalade and jam, it’s a perfect gift for the grandparents.